This kit includes everything you need to create and customize your lip balms. Includes 2 lip balm flavors, 5 containers, beeswax and coconut oil, mixing tools and stickers to decorate your lip balm containers. Make your own lip balm! Impress your girl squad by handcrafting this good-for-you lip balm made from natural ingredients - coconut oil and beeswax. Mix and melt your ingredients with scented drops to create 5 custom lip balms to keep or share with your friends. Personalize your lip balm tubes and containers with the included stickers. This kid friendly lip balm making kit is safety tested and gluten/paraben free. Recommended for ages 7 to 97. We used this as an activity for my daughters Bday party! HUGE hit! 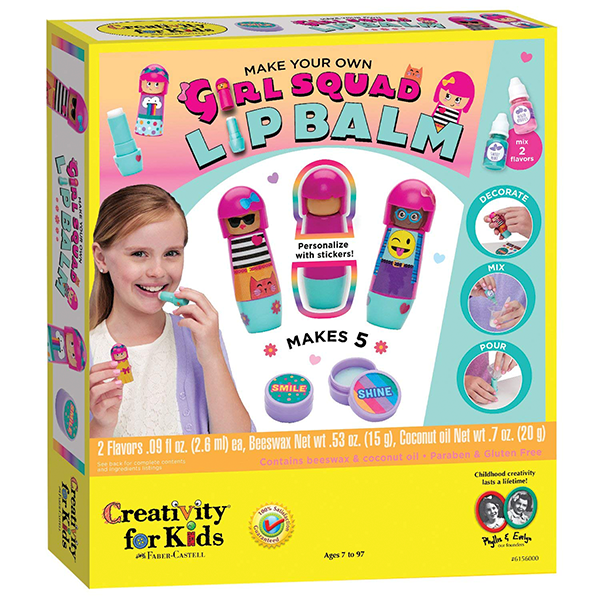 If You Liked Creativity for Kids Girl Squad Lip Balm Kit, See More Related Products Below!